As part of today's financial reports from Nintendo, the company has released additional documents outlining details such as upcoming releases on Wii U and 3DS. Most of the release windows are as expected, though a few changes have caught attention. For one thing, and likely to disappoint a number of European gamers, Bravely Default: Flying Fairy is now listed as a 2014 release in the region; that's always been the case in North America, but a European Nintendo Direct had originally said it was due in that territory in 2013. The anticipated Professor Layton and the Azran Legacies, meanwhile, is due "later 2013" in Europe, but simply has a "2014" window in North America. Some other release windows do contradict what we were previously told. Mario Golf: World Tour was pushed to 2014 in an investor briefing in June, yet its North American date in today's update says "Summer 2013" — the original release window — while for Europe the update says "Later 2013". As for the still-missing Dr Kawashima's Devilish Brain Training: Can you stay focused? in Europe, it simply has a status of "TBD". So are these all accurate? We'll see, particularly if Mario Golf: World Tour suddenly emerges as a late summer release in North America. We may take to the Mushroom Kingdom Links in 2013 yet. Summer 2013? Summer is over by now. "Nintendo bravely pushes Bravely Default Flying Fairy to 2014" could have worked better as a tagline. Jeez. You could also split the year in half as summer and winter and say summer is up to the end of British summer time when the clocks change. That's not until the end of October. I also notice that Scribblenauts Unlimited or Unmasked are not listed for release in Europe at all. I think they've both been cancelled. @ThomasBW84: Oh well, it was worth a shot, I guess. @AlexSora89 I'm kiddin I wanted to mention Mario Golf in the headline, anyway, and likewise Layton in the tagline. Anyway, well, I'd be a bit more disappointed about a Square Enix title getting either delayed or cancelled in Europe... but then I remember I used the words Square Enix and Europe in the same sentence. Welp, looks like Europe is going to have to wait with North America on Bravely Default. I'm glad Bravely Default has been reconfirmed for release given the lack of news recently. I don't mind that it's been pushed back because I'll have my hands full with Pokemon and Zelda! It's very strange that Devilish Brain Training hasn't come out in Europe yet. I don't care about Mario Golf. I wanted Mario Tennis and they made 'that' thing similar to the Gamecube game instead of making it similar to the GBA one. I'll get Layton for sure. Wanna know about those guys at the end of Miracle Mask. Frankly, I'm glad Bravely Default: Flying Fairy is coming only on 2014. My 3DS backlog is starting to get a little out of control. Kinda happy BDFF is delayed. Two huge RPGs (this and Pokemon) is a bit to much, plus i want to spend most of my time with Pokemon. I was like noooooo, but then i relalized the list of games the Wii U has...Nintendo has tought the same, i'm sure. hope we do get mario golf in summer.but if not its not like theres no other games comin out i just realy want that game. Still no Brain training ? 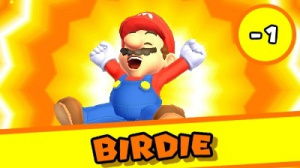 Mario Golf still may come out this year? Yes! Not joking, the biggest disappointment of E3 for me was having Mario golf delayed until 2014. I love Mario Golf, played the GCN title a ton. Give me that game now, with more depth than Mario Tennis and great online. No big deal for me. I am actually happy Bravely Default is coming to NA at all. Don't really care about Mario Golf and my Layton backlog is huge. Please all that is good and holy, MarioGolf this summer. I've been a good boy. PLEASE! Can't wait for Mario Golf! Also, Layton demoted to the tagline, I am ashamed of you @ThomasBW84. I am really looking forward to both Bravely Default and Mario Golf. Both of them are looking excellent. Wow. Disappointed BD:FF was delayed. You guys in Europe STILL haven't gotten Brain Age/Brain Training? @OdnetninAges We're as clueless about why as you are. Mario Golf was supposed to get me through the summer drought that I've been experiencing. A lot of other 3DS games just aren't for me, but that was the one I was looking forward to most all summer. Bets on which will be released first in Europe – Bravely Default on 3DS or Scribblenauts Unlimited on Wii U? I'm really excited about Bravely Default, but if we're getting both Layton and Zelda this year already I'm ok with waiting. Welp, I've completely given up on Scribblenauts Unlimited ever coming to Europe. By the time it does arrive, assuming it ever does, too many other games will be taking up my time for me to care. I'm glad Bravely Default has been pushed back. Once I get a 3DS, there will be too many RPG's to get through, so it'll be good to have a gap. I wonder what the problem is with Brain Training. The first game was tested in a time frame of 2 months. Even with daily changes to the voice recognition software. 2-3 people from every supported region had to sit in a small soundproof box and keep naming colors etc, to fine-tune the software. I can't believe they are taking so long. Or its already tested and they're just waiting for the right moment to release it. Anyway It took another 2-3 months for Brain Training 1 to get released in Europe. Two whole months playing Brain Training each day for up to 9 hours... Still scarred for life. I want Bravely Default, not lame Mario Golf lameness! If a late summer release is true for Mario Golf, I might be in a spot of trouble. The Gamestop near me took the money I had on pre-order for Mario Golf and transferred it to the pre-order I have for Mario and Luigi and Pokemon X. Now it might end up looking like I'll have to take that $35 for Pokemon X and transfer it to a brand new pre-order for Mario Golf. Like I said, I might be in a spot of trouble if this turns out to be true. I would be so happy if Mario Golf came out this summer! Mario Golf would be a great gap filler until Pokemon and Zelda come out. Then you can truly say Nintendo never let up as they would've then released a game every month since February. EDIT: Okay July was pretty barren for Nintendo's 3DS releases. Let's just count SMT IV as a 1st party product, lol. @Windy: Added you, and we'll see what happens in the future. really interested in Mario Golf and Brain Age and Layton when it comes to NA! I can have Mario Golf: World Tour this year?! Mario golf still coming this year?! That...was unexpected! !